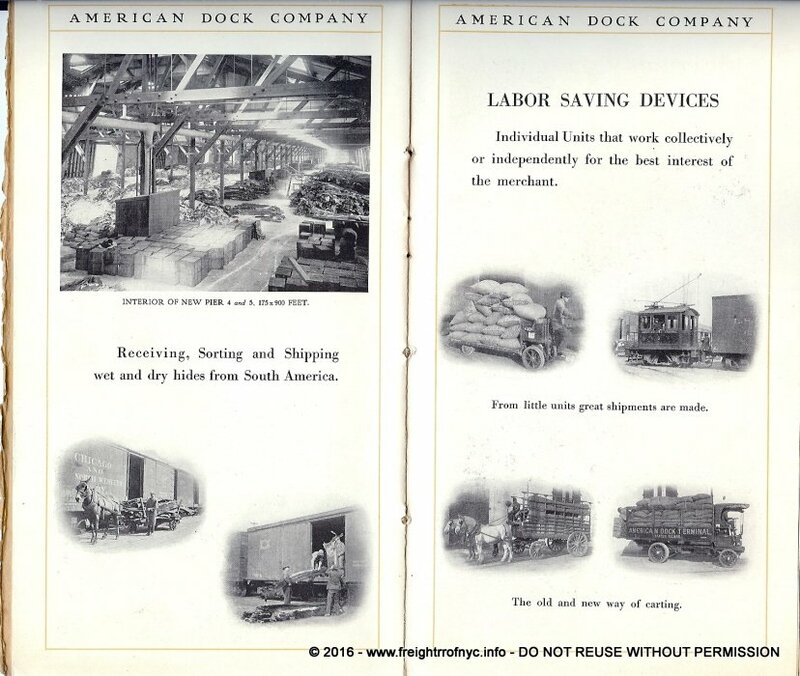 American Dock Company, also known early on as American Dock & Trust; was located in Tompkinsville on Staten Island. 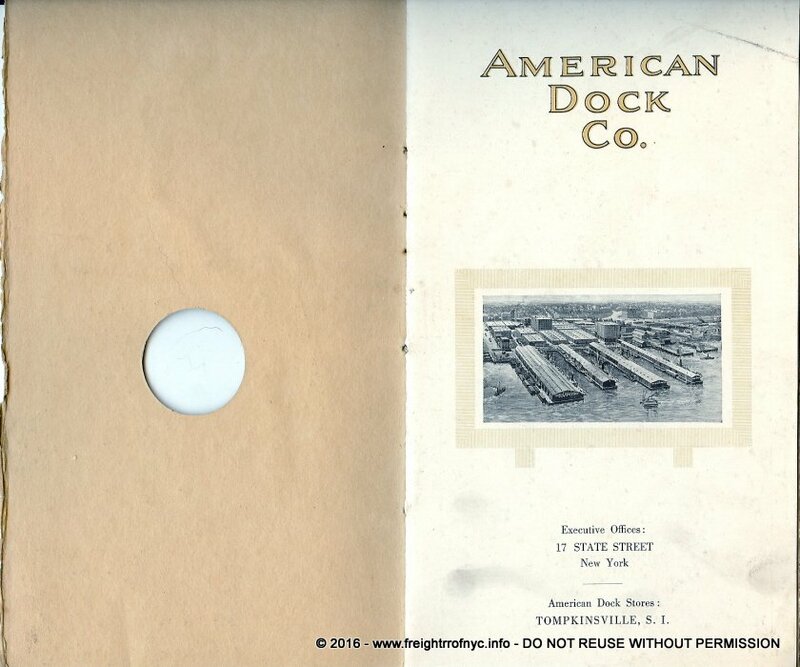 Not much is known at this time about American Dock at this time, and research on this company is underway and this chapter is subject to expand. 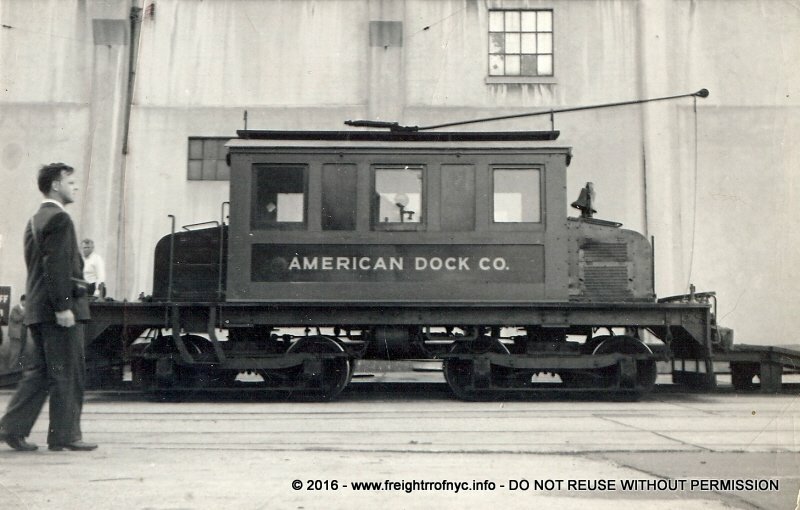 The American Dock Company was founded by Alfred J. Pouch in 1872, before the Baltimore & Ohio Railroad arrived on Staten Island. 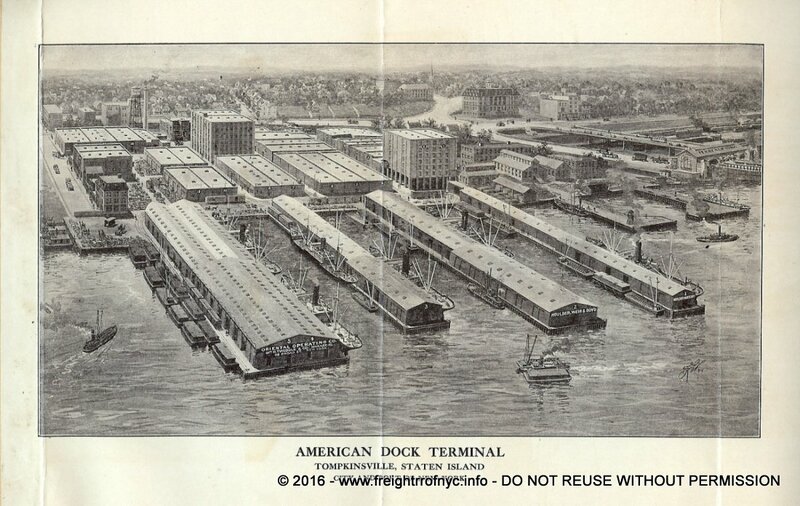 At this early date, American Dock consisted of Piers 1-5 as well as warehouse space. 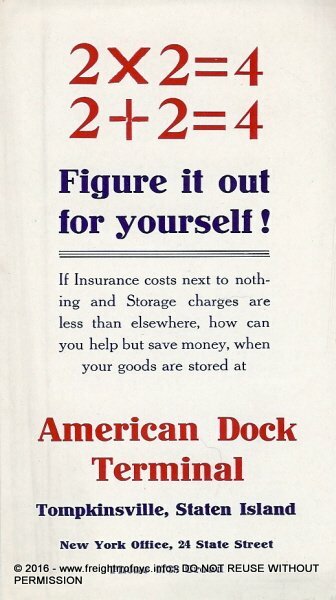 Over the decades, the management of American Dock's would change a few times. 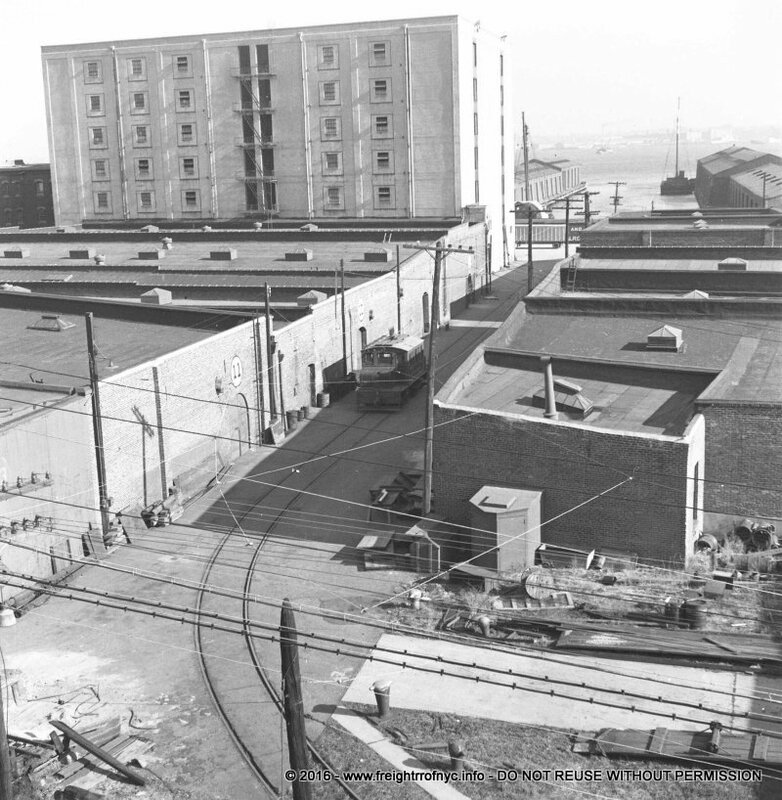 In 1886, American Dock suffered a siginificant fire in one of it's cotton warehouses. In 1906 it is listed as the owner of Staten Island Stores, a large warehouse storage complex comprised of twenty-one warehouses. 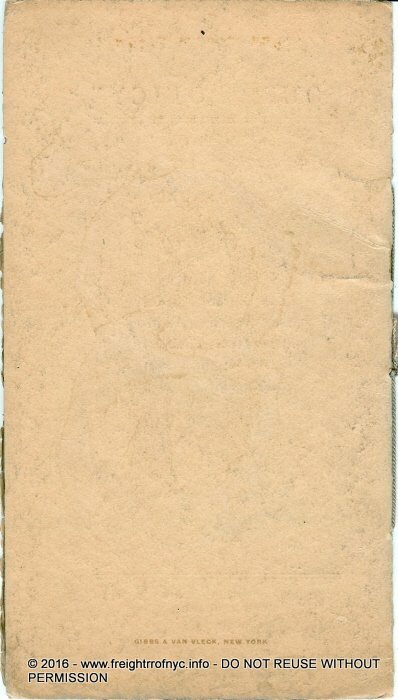 In several other New York Times articles located by this author dated from the summer of 1906; it was revealed that the American Dock Company suffered numerous fires in their cotton storage facilities, more specifically no less than four fires in an eight week time span, of which those fires destroyed six of those warehouses. One might think this would be the work of an arsonist, but according to the Fire Marshal this series of fires were not arson, but more probably careless workers. As there were extremely few or no electric lights in older style structures of this era, kerosene lanterns were used for portable illumination, and you can very well guess, cotton bales are very flammable. Cotton bales can smolder for days, and sometimes weeks in the center of the bale, without being detected visually on the outside. Most logically, what probably occurred was that a warehouse caught fire, and the fire extinguished in due course. 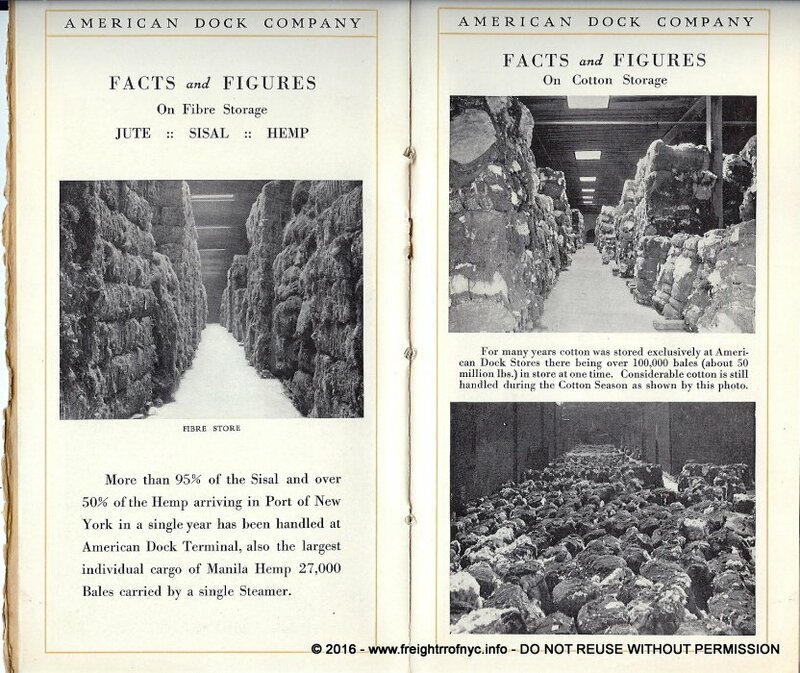 Some salvageable cotton bales were transferred to another warehouse, while repairs commenced on the fire damaged structure. The salvaged bales themselves may have appeared to be normal, but deep inside, they were smoldering. Within a few days, they would erupt into flames and take out that warehouse too. As a result of these fires, insurance premiums skyrocketed for cotton storage and directly affected New York Dock and Bush Terminal who were also in the business of storing cotton. 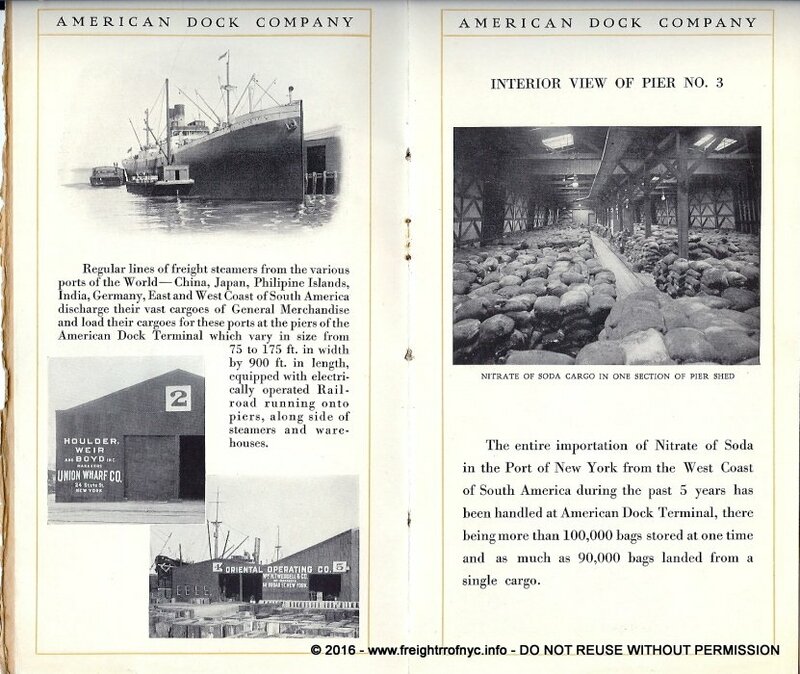 Insurance was cancelled outright for American Dock, but as a result of these fires, Bush Terminal and New York Dock had to enter into agreement with the New York Fire Insurance Exchange, to make their warehouses fire resistant, install sprinkler systems, etc.. 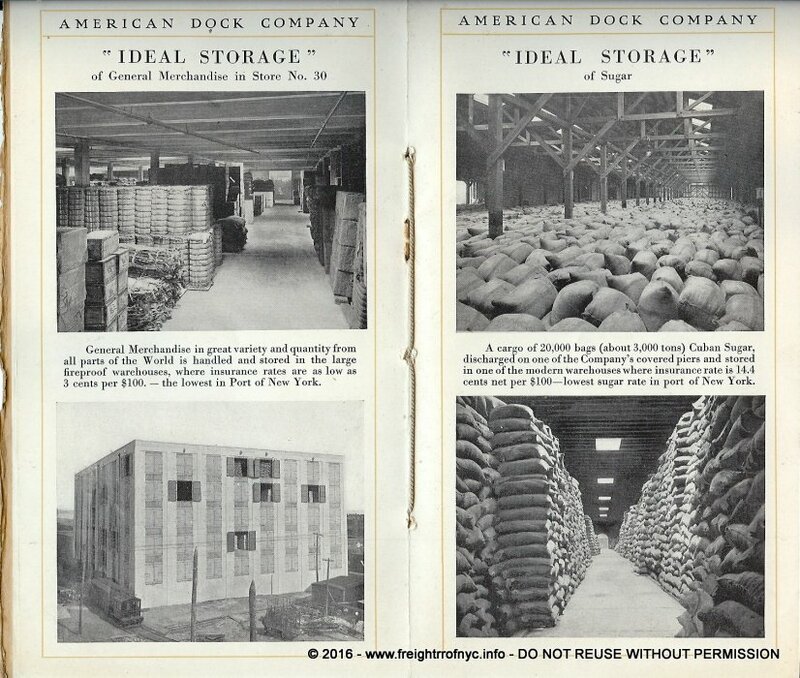 In another twist on this fire hazard, the Pouch Brothers (who would own Pouch Terminal of which is discussed in another chapter on this website) offered to purchase American Dock properties, as from it's lack of stated position, appeared that it would retire from the cotton storage business. 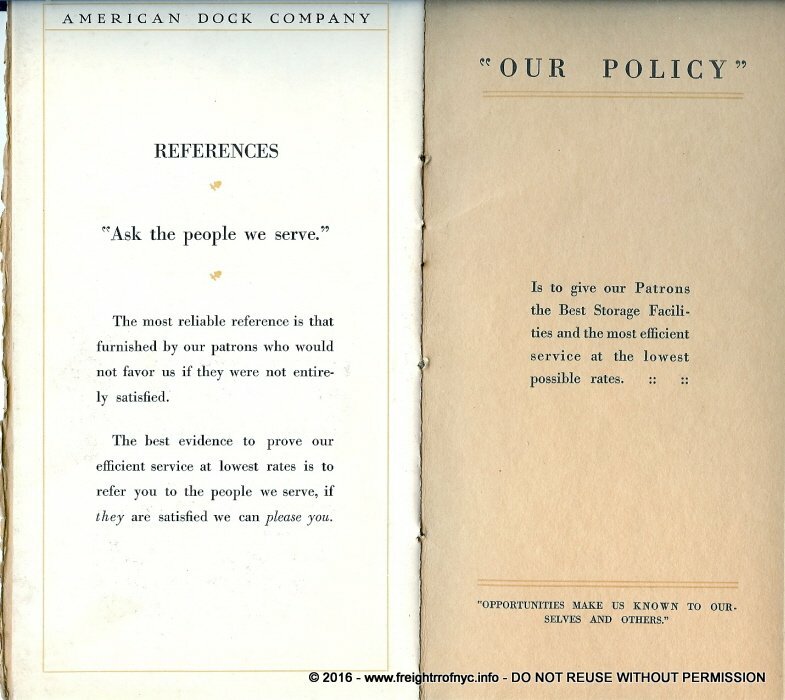 It turns out F. P. Pouch was president of the American Dock Company during this time. I was fortunate to locate the following map in the New York Public Library archives. It is from a series of Topographical Survey Maps for the Borough of Richmond (Staten Island) dated 1911. 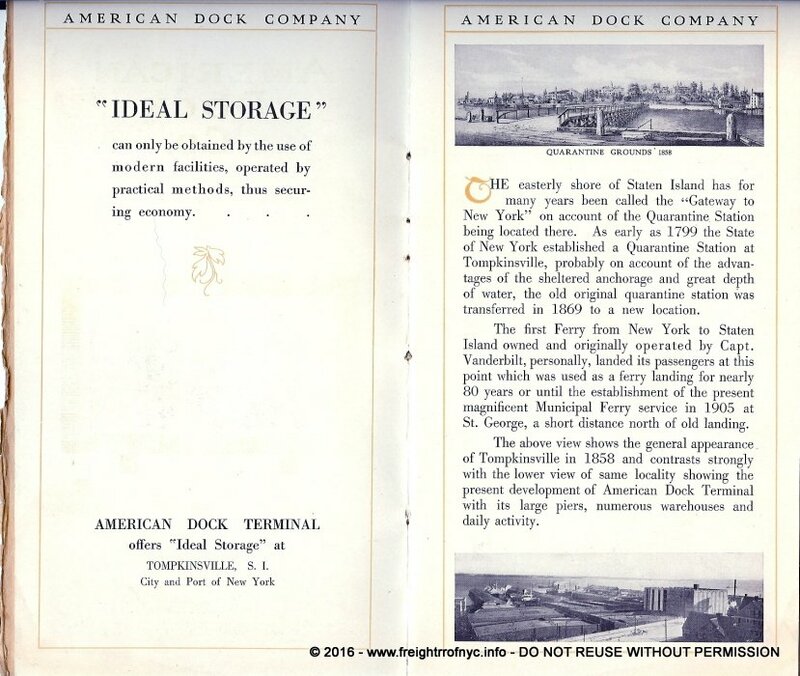 "The American Dock Company is one of the oldest terminal companies at the Port of New York and is located at Tompkinsville on Staten Island. The property of this company covers an area of about 30 acres including grants of land under water and has a water frontage of 946 feet at the bulkhead line. The property of the company includes five piers with an area of 386,955 square feet, in addition to 30 warehouses with about 671,000 square feet of floor space. The terminals are served by tracks connecting with the Staten Island Rapid Transit Co, a subsidiary of the Baltimore and Ohio railroad. 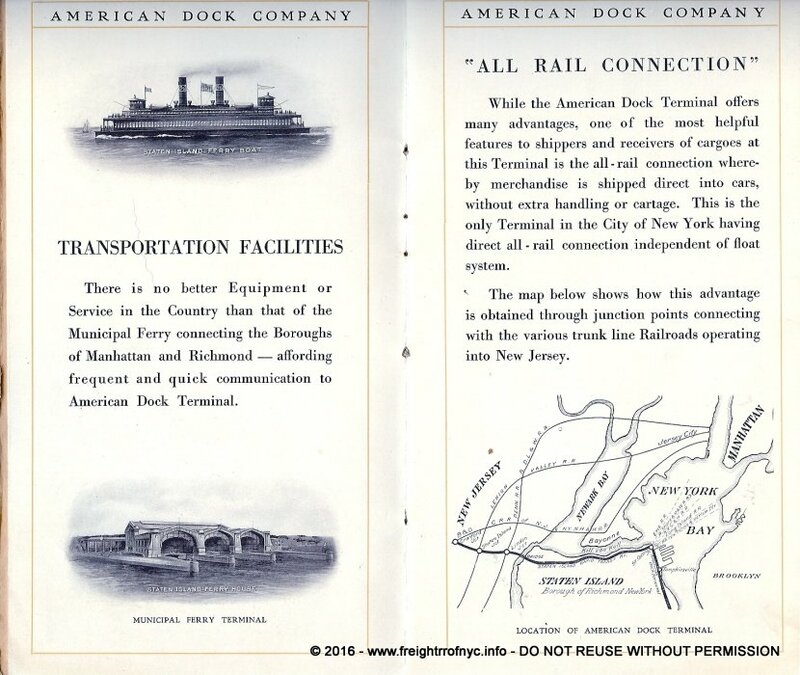 No carfloats are used at these terminals for interchange of freight between railroad and vessel, since direct rail connection is made by means over Arthur Kill connecting Staten Island with New Jersey. 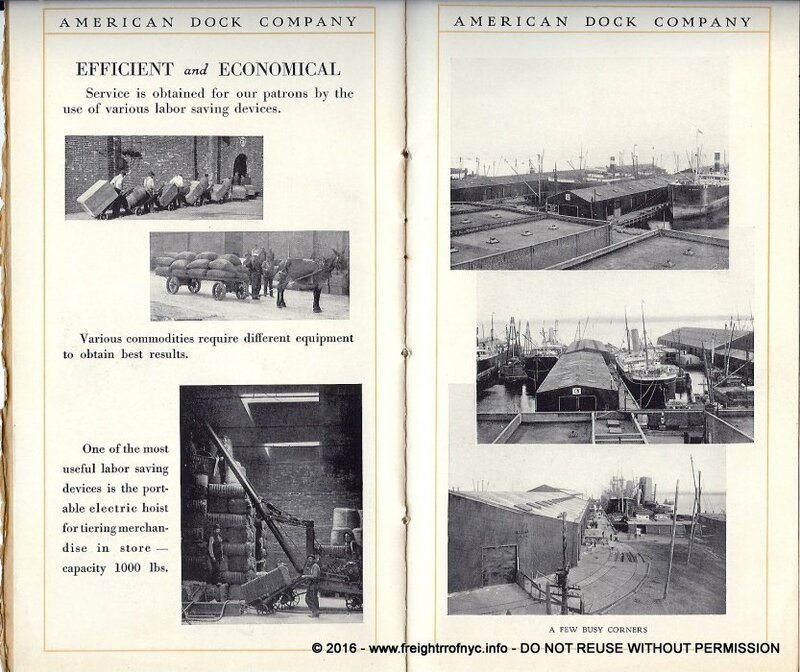 Three of the piers of the American Dock Co. are leased to and operated by shipping agents, Piers 1 and 2 being controlled by Houlder, Weir & Boyd, and Piers 4 and 5 (one pier in fact) by the Oriental Operating Co. Piers 3 and 6 are operated by the dock company." 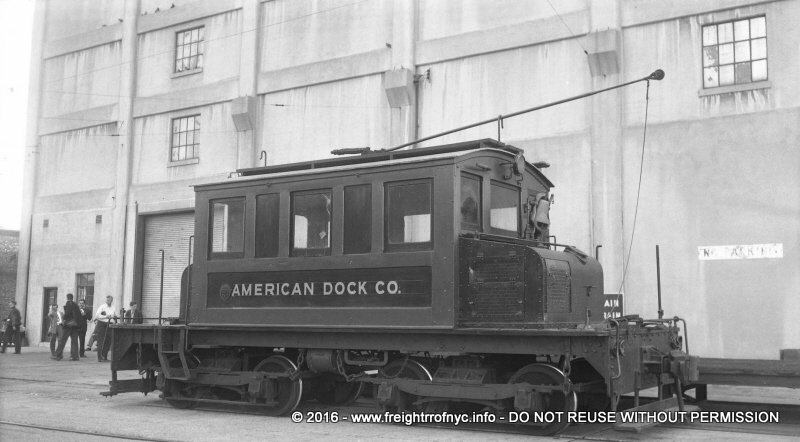 4 & 5 835' x 175' Oriental Operating Co.
"The American Dock Co. is located at the foot of Arrietta Street ,Tompkinsville, Staten Island. 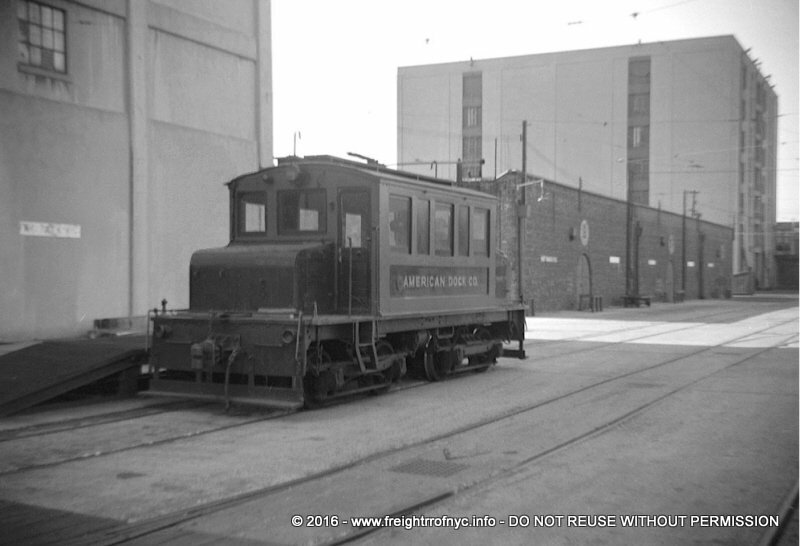 It is used by all railroads but maintains no carfloat or lighterage service." 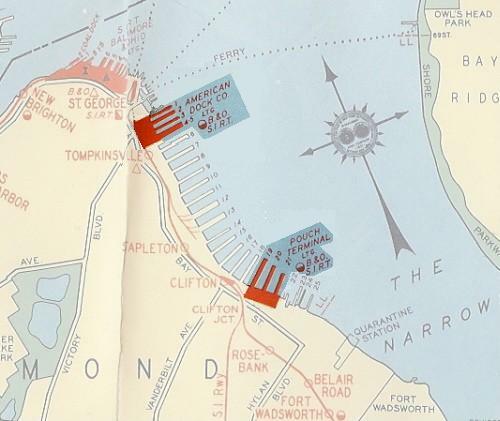 The Port of New York Authority "New York Harbor Terminals" map of 1943 and 1949 shows the American Dock and Pouch Terminal facilities as two distinct properties, with American Dock at Tompkinsville (where we would expect it) and Pouch Terminal further south at Clifton connected by the Staten Island Rapid Transit (operated by the Baltimore & Ohio RR). 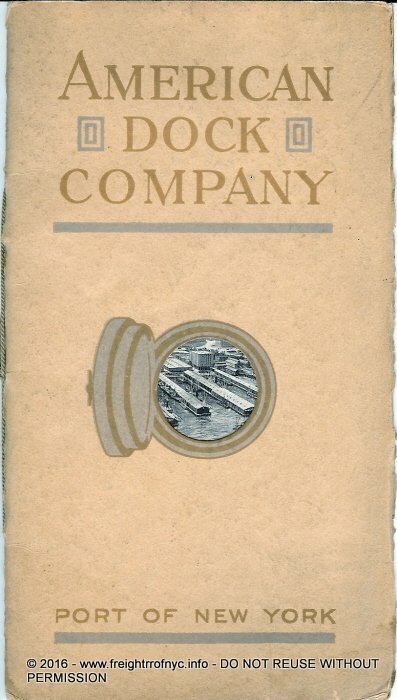 The image at the top of this page, is an excerpt taken from the Map of Railroad and Terminal Facilities in the Port of New York, as issued by the New York Central Railroad in 1943. 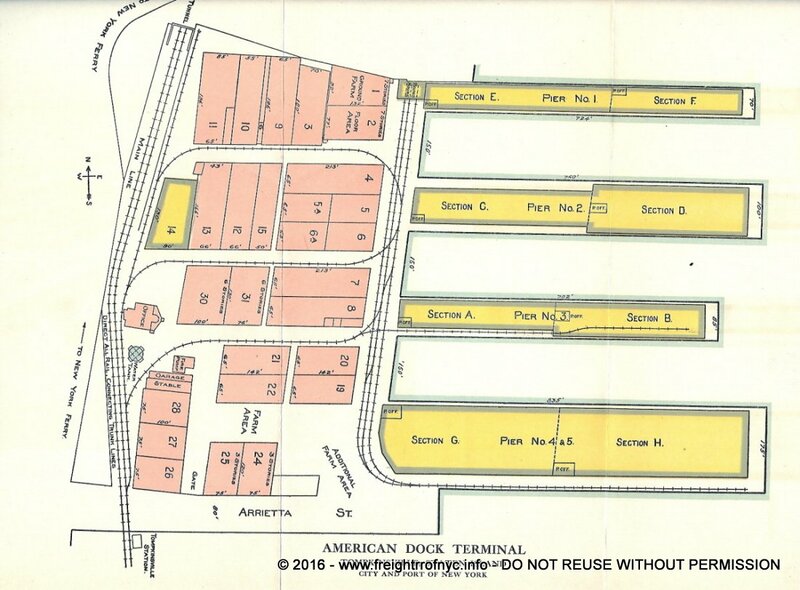 This image shows the close proximity of Pouch Terminal to American Dock Company, and the very close proximity of American Dock to the Baltimore & Ohio St. George Terminal. 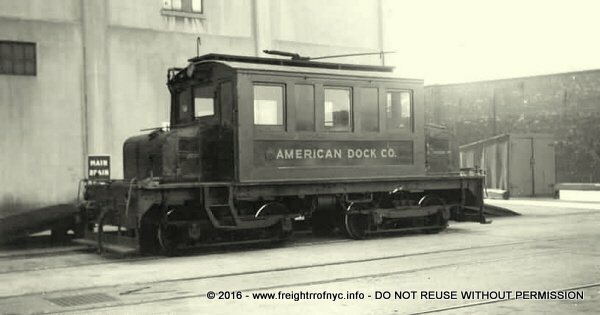 Inbound freight arriving at Pouch Terminal came either by carfloat via the Baltimore & Ohio Railroad St. George Terminal, or via the Staten Island Railway (Baltimore & Ohio Railroad) via New Jersey and the Arthur Kill vertical lift bridge.. Both American Dock and Pouch Terminal are denoted as having lighterage and with a red semi-circle which means Car Load Delivery.. Neither property is listed in the 1961 edition of this map. 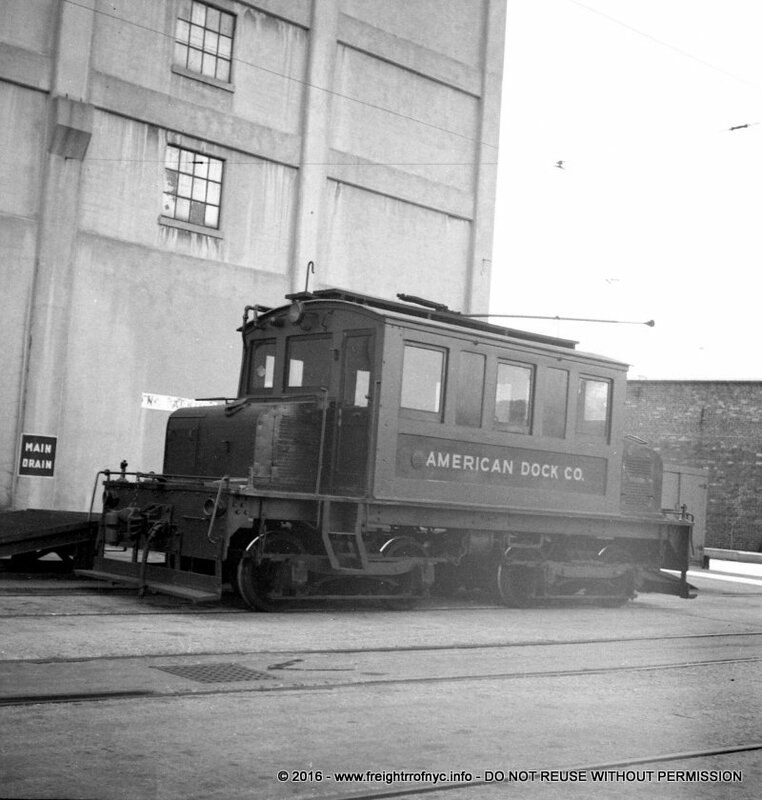 It is not known at this time how extensive the American Dock Company trackage as we know, no float bridges are known. 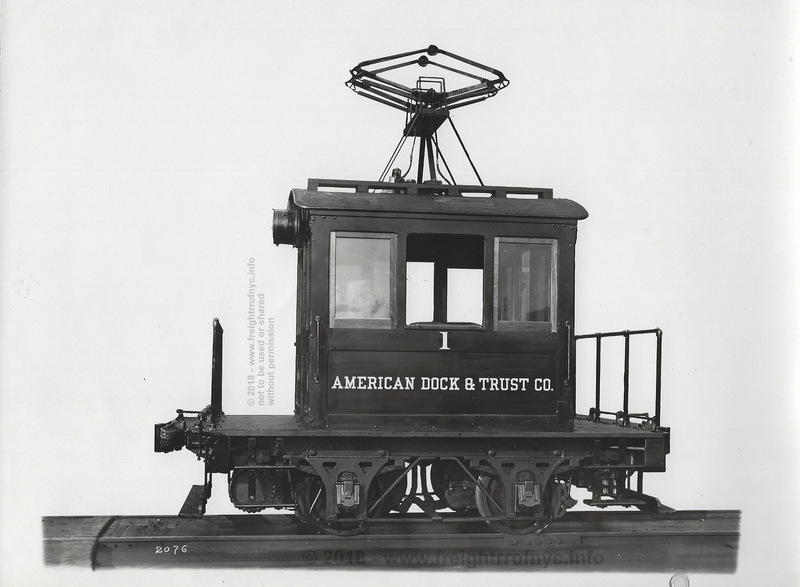 Baldwin Locomotive Records reflect three entries for the American Dock Company. All were overhead electric (trolley wire). These electric mules were numbered #1 and #2. Fortunately, photos exist of #1 (first) & #2, which can be seen immediately below. 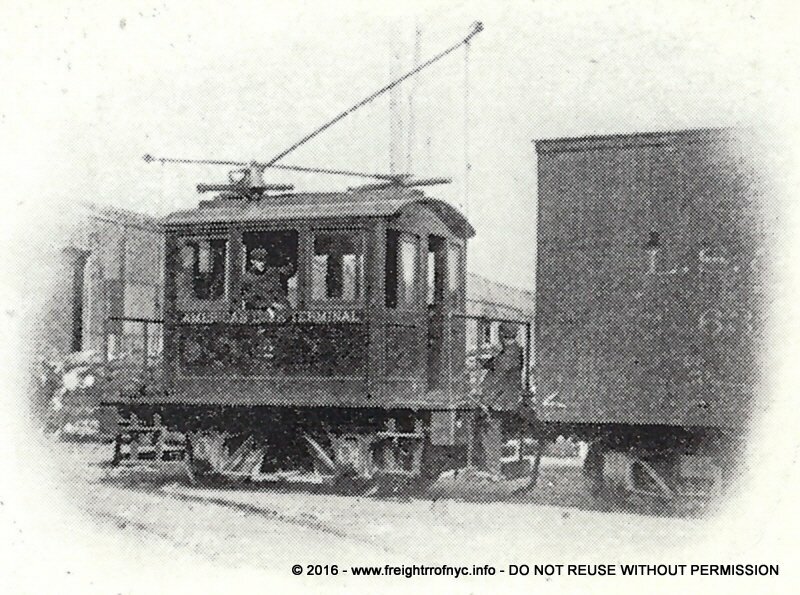 As for the other locomotive #1 (second), this unit was substantially larger, but also electric powered. Pictures exist of this locomotive as well. 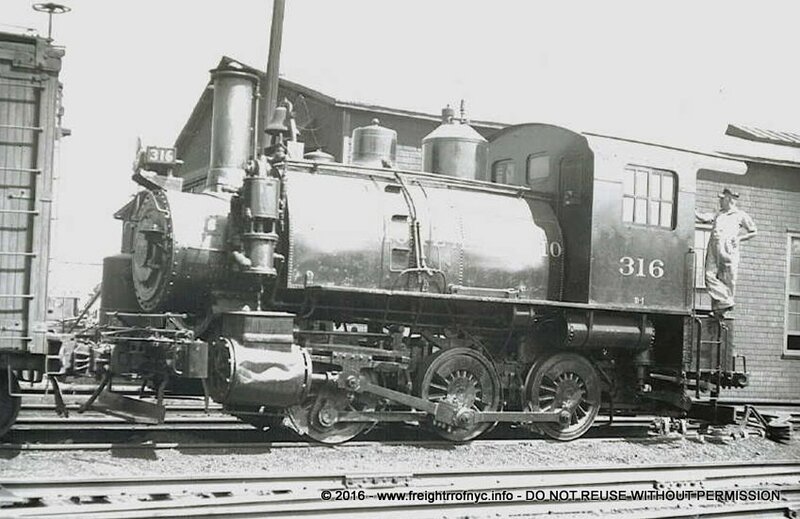 According to Ed Bommer, (a Baltimore & Ohio RR historian), the B&O used #316, an 0-6-0T steam locomotive to switch cars at American Dock. 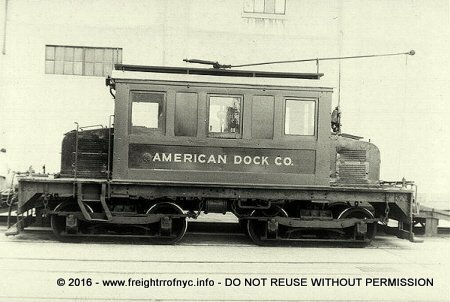 This locomotive was originally reconstructed from another locomotive to be used at the B&O West 26th Street facility (an offline terminal covered by this website). 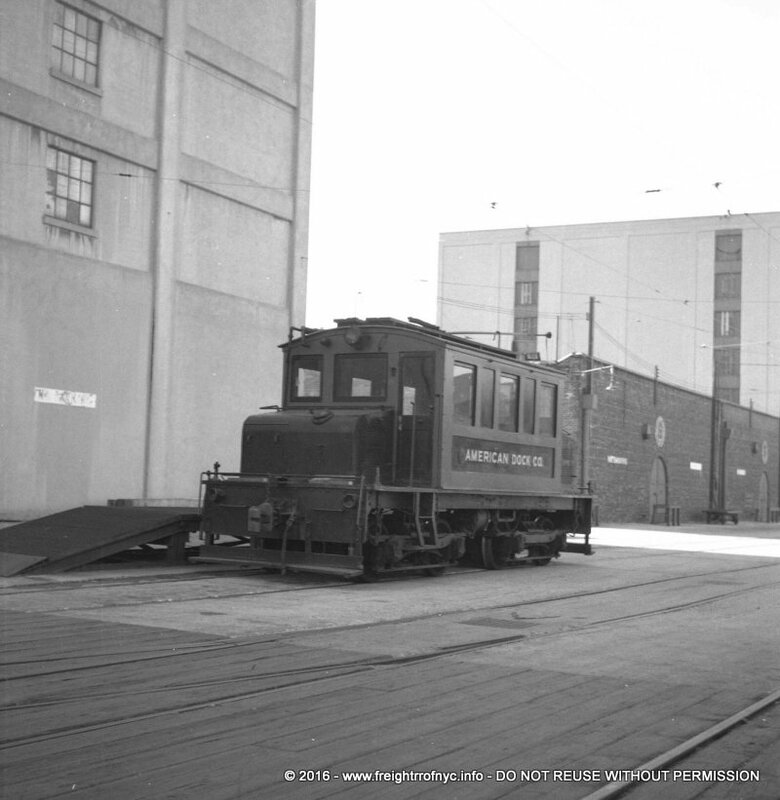 Note #1 has a mini pantograph and not a trolley pole as on #2 below. Note: #2 has dual trolley poles and not a mini pantograph as on #1 above. Appears to be a railfan day. Note camera on gent in foreground. Appears to be a railfan day. Note guy in white shirt. Same guy can be seen in photo above. the City of New York Municipal Piers at Stapleton. Mack Trucks "Manhattan" cab over engine truck (introduced 1905)!